The post Bad Dog Breath — 8 Home Remedies by Julia Szabo appeared first on Dogster. Copying over entire articles infringes on copyright laws. You may not be aware of it, but all of these articles were assigned, contracted and paid for, so they aren’t considered public domain. However, we appreciate that you like the article and would love it if you continued sharing just the first paragraph of an article, then linking out to the rest of the piece on Dogster.com. I share my life with a pack of super-affectionate dogs who love bestowing kisses — and, not wanting to hurt anyone’s feelings by refusing a sloppy smooch, I’m motivated to keep their mouths healthy and halitosis-free. Over the years, I’ve picked up a few home remedies for bad dog breath that really work. 1. Prevent bad dog breath by brushing your dog’s teeth regularly. 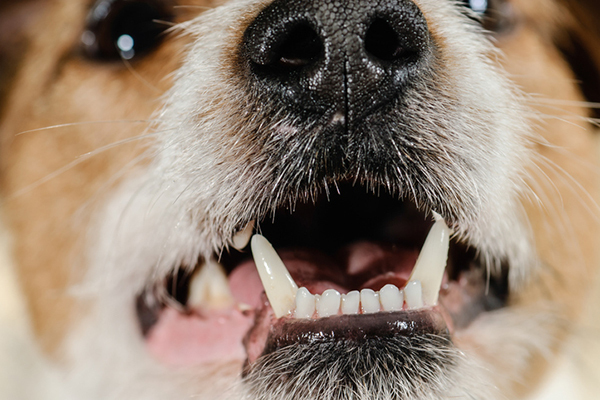 There are simple home remedies for that bad dog breath! Photography ©alexei_tm | Thinkstock. It isn’t normal for your pup to have bad dog breath — it’s actually a sign of an unhealthy mouth. Left untreated, sick teeth and gums quickly lead to life-threatening health problems. So please, brush your dog’s teeth regularly— at least once a week. If you have a dog with a small, pushed-in face or a brachycephalic dog, such as a Shih Tzu, you really need to be brushing those teeth every single day, because the conformation of their little mouths leaves them extra-vulnerable to decay. Ply your pets with treats to help them associate tooth torture with tasty treats, and use toothpaste made just for dogs. Pick a paste with a flavor you actually like — vanilla-flavored Triple-Pet toothpaste with tea tree oil is a great choice. 2. Dental chews help keep bad dog breath at bay — just know which ones to choose. 3. Speaking of chlorophyll, wheatgrass is another good home remedy for bad dog breath. I clip off some of the fresh wheatgrass I give my cats and add it to the dogs’ food. That raw source of chlorophyll is an excellent remedy for bad dog breath. 4. Dogs can also drink bad dog breath away. Your dog’s bad breath can also be solved with what you put in his water, too. Photography ©Chalabala | Thinkstock. Chewing isn’t the only way pets can polish up their own teeth. Dogs can also drink their way to fresh-smelling breath with Healthy Mouth Dental Water, an all-natural cocktail made of enzymes, chlorophyll and other ingredients designed to blast away bad dog breath. 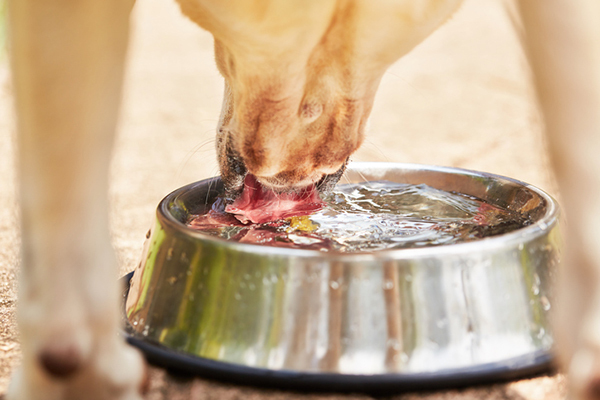 Simply replace your pup’s regular drinking water with Healthy Mouth-spiked wet stuff, and you’ll notice a difference within days, as the active ingredients work to kill bad bacteria in the mouth. 5. Probiotics are another line of defense against bad dog breath. Speaking of bad bacteria, you’ll want to be sure that your dog’s mouth is populated with beneficial bacteria that way outnumber the harmful, halitosis-causing kind. That’s where probiotics come in. Use a probiotic made especially for dogs, and you’ll notice a big difference — not just in keeping that bad dog breath at bay, but in your dog’s overall well-being. 6. Coconut oil can help with bad dog breath. Ah, coconut oil. It doesn’t just boost digestive, immune system and metabolic functions — it also helps to combat bad dog breath. Put a lovin’ teaspoonful over your dog’s food every single day, and you’ll soon sniff sweeter breath— plus dogs love the taste; for them, coconut oil is a sweet treat. Some dog lovers even brush their pets’ teeth with coconut oil, making the chore an offer even ornery canines can’t refuse! 7. Neem is another good home remedy for bad dog breath. Like coconut oil, neem (an extract of the neem tree) is one of those brilliant botanicals that have many positive effects on dog (and human) health. Besides being great for the skin and coat, neem is also excellent for promoting oral health in hounds and humans. My dogs take Supercritical Neem Leaf Extract by Organix-South; I add one little black capsule to their food twice weekly and take one every day myself. 8. Cinnamon is another common household item that will freshen up dog breath. I add a sprinkle of breath-sweetening cinnamon to my dogs’ meals at every feeding. Thumbnail: Photography © vadimguzhva | Thinkstock. This piece was originally published in 2015.